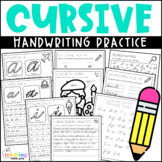 Introduction to cursive writing - just what my second-graders live for after state testing. This file has 3 letters on each page. Students can trace the letters and then practice writing them on their own directly below. Summer Fun Theme to bring fun into their new learning. Introduction to Uppercase Cursive Writing - Just what my second-graders live for after state testing. This file has 3 letters on each page. Students can trace the letters and then practice writing them on their own directly below. Summer Fun Theme to bring fun into their new learning. There are practice pages for each letter of the alphabet plus each capital. The pages can be used in any order. They have an animal theme and the letters are in the Zaner-Bloser style. This package matches up with my Manuscript Practice - Zaner-Bloser Manuscript file. 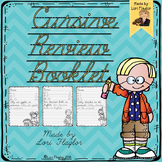 This brightly colored, ocean themed, Zaner Bloser based cursive practice book gives students practice with cursive in sentences and in answering questions. The book includes a blank practice page at the end for additional practice. Also check out the Ocean Themed Cursive Alphabet Practice book! There are practice pages for each letter of the alphabet plus each capital. The pages can be used in any order. They have an animal theme and the letters are in the Zaner-Bloser style. Cursive practice pages are in the works. Stay tuned! Name and attributions for handwriting practice from each of the seven Georgia Second Grade heroes in Zaner-Bloser style printing and cursive. These saint quotes may be used in a grades 6 - 12 classroom to practice cursive while reflecting on the wisdom of famous saints. This packet contains visuals and activities that relate to the story Abraham Lincoln and skills that are taught in Reading Street 2nd grade, Unit 2 Week 2. The activities can be used for literacy stations, centers or other small group activities. There is also a sample choice board if you prefer.